Join us and immerse yourself into the century-old elegant dance of Argentine Tango! 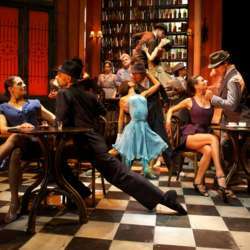 This workshop is for anyone that is curious about Argentine Tango and wants a chance to experience how it looks, how it sounds and how it feels. The workshop will be given by a good friend of mine and he is one of the best instructors in Istanbul Tango scene. At this workshop you will learn the essentials to get started leading, following and connecting to the music and your partner. No partner needed, we rotate partners in class. After the class we will go to a local bar for drinks. If you sign up and don't come, I have to cover the costs of the dancing space. Please sign up for the workshop you intend to come. Looking forward to seeing everyone who can join us for a great time!